mar 1794 or 1795 to Elizabeth Day [descendant of Edward I]. He demolished Tralee Castle in 1826, after it had defined Tralee for 600 years. First he erected a more modern building at Tralee, in 1804, which ran into the old castle. But it didn't really work. He ceased to live there and both buildings fell into ruin. The old Tralee Castle was demolished 1826 [Limerick Chronicle, 19 Apr 1826]. Denny Street was laid out at the site in 1826. Named after the original Sir Edward Denny. Georgian houses. The finest street in Tralee. Some of the stone from Tralee Castle was used in the Georgian buildings on Denny St, and some of its timber to make their doors. He was MP for Tralee 1828-29 (NOT his son). Returned unopposed in by-election 12 Sept 1828. Resigned 1829 (by-election to replace him 9 June 1829). Had house in England, Kingsend House, Worcestershire. See his will dated 1831. He and his wife are bur in Powick churchyard, Worcestershire. the Blennerhassetts tended to support the Dennys. Sir Piers Denny, 9th Baronet. he is probably "William Denny, of Strand St, Tralee" who stood unsuccessfully as a Conservative against Maurice O'Connell in Tralee in general election of 1835 and general election of 1852. 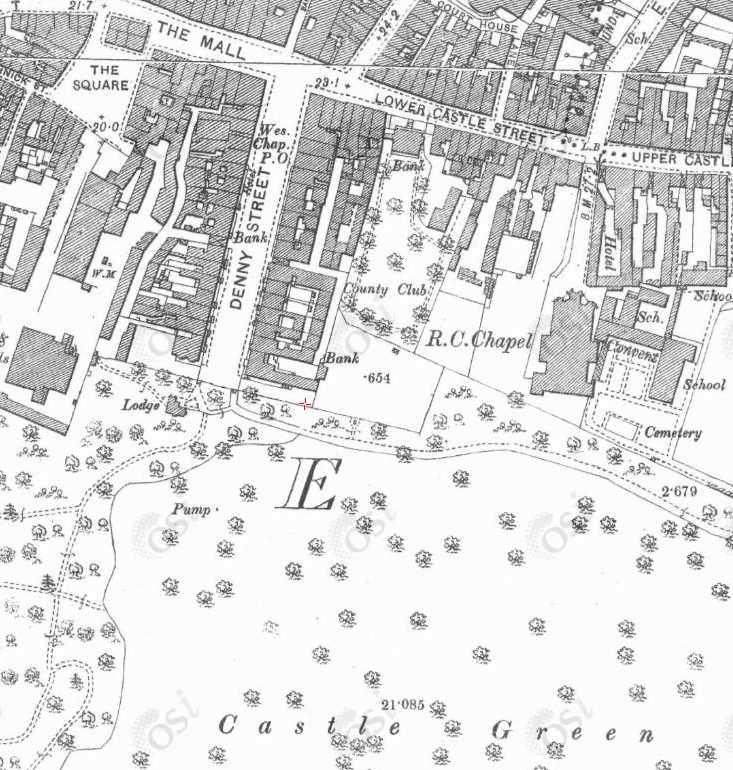 Site of Tralee Castle on 1887 to 1913 map. Denny Street has been built on the site. The grounds are now Tralee town park. See modern street view on Denny St.
Edward St, Tralee, is probably after Sir Edward Denny [not sure which one].